For some reason, I have been wanting to make a coconut cream pie for months....since last summer, really. I'm not even sure if I've ever had a coconut cream pie before. At least not one that was truly homemade. I think the only kind I've ever had consisted of coconut pudding and cool whip and it was many years ago. So I'm not sure why I've been craving this pie, but I'm glad I finally made it. I've been really loving all things coconut lately. I decided to treat myself and made it for my birthday weekend (and my wonderful husband had made me a surprise batch of these coconut brownies that he topped with almonds as suggested by one of my readers. They were awesome). Needless to say, I had a lot of delicious desserts filled with coconut for my birthday - and I shared so we didn't eat them all ourselves. Making a coconut cream pie from scratch is time consuming. I used this recipe from Betty Crocker, but changed a few things. One thing I changed is that I didn't add the butter to the filling (by accident), but after I don't really think it was necessary. It was already very rich and creamy. Another thing is that I used unsweetened coconut. Since I usually cut the amount of sugar in desserts anyways, I didn't add any more sugar and it was sweet enough for us. Below is my modified recipe. Back to this pie... I found the original recipe for the pie on Damn Delicious. I made the recipe as written and enjoyed it, but I changed it up the next time because I wanted less cornbread and more topping. I changed around a few other things as well to create the below version of this dish. The cornbread is a touch sweet and the chicken mixture has a spicy and smoky flavor that all go really well together. Give it a try - it will feed about six people and is perfect for a chilly day. I've gone from not really liking spaghetti squash, to being a little sad that I used the last one in our winter stash to make this dish (again). Luckily, it makes a lot and I get a couple lunches out of it, too. This spaghetti squash bake is a combination of this recipe from Girlichef and a dish I've made with spaghetti squash in the past. Spaghetti squash it such an interesting vegetable. That it transforms from this big, heavy and hard winter squash into light little strands is quite amazing. I think a lot of people try to "replace" noodles with spaghetti squash strands and I think that's why it never worked for me. I went in with the wrong mindset. Once I accepted that the spaghetti squash was the star in its own right, I began to appreciate it more. And while this dish could certainly use spaghetti in place of the squash, I would rather have it with the squash. That's the sign of my official transformation to a spaghetti squash fan. Incidentally, my other favorite way to eat spaghetti squash is this gratin - it's delicious. This dish may not be the most photogenic, but it's still truly delicious. The below recipe will make enough to feed four to six people. I haven't experimented much with almond flour in the past. A friend of mine gave the Gluten-Free Almond Flour Cookbook for Christmas, so it's a perfect time to start learning and using it a bit more. This little cookbook is full of dishes that use almond flour as well as things like arrowroot powder, which I've started using as a thickener in everything from pudding to stew. One of the first things I made from this cookbook was the pancakes. I think pancakes are a great way to try new flours at first to get used to their tastes, textures, etc. We really enjoyed these pancakes a lot. Below is my slightly modified version. I served these pancakes with warmed maple syrup, almond butter, and sliced almonds. Berries would be a nice choice for serving, too, if they are in season. This recipe will serve about four people. Here is the round-up of date recipes I received for the Veggie/Fruit a Month event that a hosted in December. 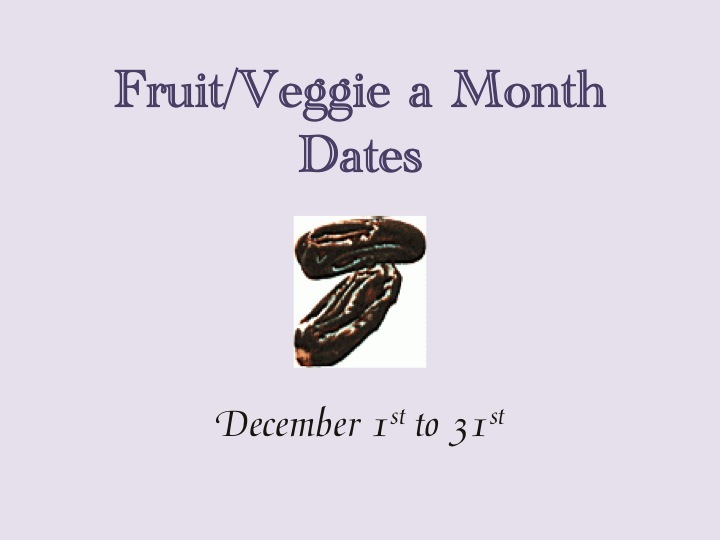 I find that dates are a perfect base for holiday dishes and treats, so that is why I picked them for the month of December. Unfortunately, I didn't receive many submissions, but that's OK. I know December tends to be a very busy month for many people. The recipes I did get look really fantastic though and I hope they encourage people to incorporate this delicious fruit into their cooking more often! I have to admit that I have missed having sweet treats around to pop into my mouth after dinner now that all the Christmas cookies are gone... Recently, I saw this kabocha pudding recipe and was inspired to make one using coconut milk. Kabocha has quickly become one of my favorite winter squash since discovering it. This first time I used kabocha was in a dessert of very similar flavors, Thai sweet pumpkin. Kabocha is a very sweet squash, so it really lends itself nicely to dessert recipes. Plus it's dry and smooth - it really has an unbelievably nice texture. This dessert is simple in ingredients and it pretty healthy as well. When I know I'm going to be using squash puree during the week, I try to cook them up over the weekend at a time when I have the oven on anyways, so they are ready to go during the week. It's much easier than trying to bake, puree, and then use a squash all in the same evening. I find that this is one of the many benefits of menu planning each weekend for the upcoming week. This pudding was really good. I used ground cardamom in it, but I think that cinnamon or ginger would also be nice in this dessert. This recipe made three servings. Have you ever had beer-cheese soup? If so, and you liked it, you will really like this mac n' cheese since it's basically a really creamy beer-cheese soup with noodles. Is there an end to the possibilities of macaroni and cheese? Readers know that I love this comfort food and while I love classic mac n' cheese, I also enjoy it with smoked cheese and pumpkin, Mexican flavors, and summer squash, just to name a few. This was my first time making it with beer. I chose a milk stout (because I thought that made sense given that it was going into a milk and cheese sauce) from one of our favorite local craft breweries, Southern Tier Brewing Company. This specific beer is not required for this recipe, but make sure it's a stout you enjoy drinking because the flavor will be prominent in the dish. I've seen Guinness mac n' cheese and similar on menus at places like Irish pubs. This recipe will serve about six people. Serve this mac n' cheese with a green salad with a nice vinaigrette to cut through the cheese sauce. I also put out some briny and spicy green olives. This dish is perfect for the weekend or a snowy evening with a nice beer.